Resin infusion laminating and light resin transfer moulding are covered in a single course due to the similar nature of the processes yet distinctive merits. This course covers a full range of materials and processing techniques, giving an in-depth and hands on approach to understanding how the processes work and how they can be applied successfully. This course suits lead technicians, supervisors, engineers, designers and researchers who are responsible for trials, development and tooling design associated with Resin Infusion laminating and Light RTM. Do you recommend any reading material prio﻿r to the course? I already have experience, how can your course help me? How can you teach beginners & experienced personnel on the same course? This course is suitable for technicians, supervisors, engineers, designers and researchers who are responsible for production, trials, development and tooling design with resin infusion and light resin transfer moulding (RTM). We cover approximately 26 hours of practical throughout the week. Resin infusion laminating is split into two distinct categories; resin flow infusion and resin film infusion. The course begins by looking at the resin flow infusion method and the various factors that influence resin flow. You will learn about the practical implications of Darcy’s law (fluid flow through the medium) in terms of flow channels, pressure dams, vacuum, temperature, viscosity and effects of permeability. All of these factors are discussed in theory sessions and then applied to produce trial panels, using different external infusion media and fabrics. Next we look at core materials and their uses, applications and limitations. Working with suitable core materials you will produce additional infusion trial panels and use this information to produce an infusion strategy to predict flow fronts your components. This will highlight the advantages of using core materials, for strength and weight saving, and how it will affect the infusion strategy. The trial panel information is then used to plan and infuse a detailed component, mapping the trial information onto the part, to highlight any discrepancies that occur during the infusion and their causes. 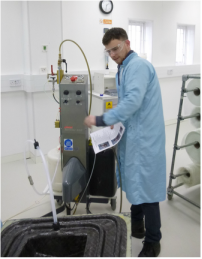 We then move onto conducting resin infusions using a wide range of internal media and reinforcement fabrics. By using re-usable vacuum bags as well as semi-rigid closed tooling, you learn how single and double sided parts can be very quickly produced for higher volume production. This highlights the differences with external and internal media, as well as flow characteristics and positioning of resin entry and vent points. This leads to an understanding of the differences between Resin Infusion and Light Resin Transfer Moulding. Mould design is key when producing closed moulds for infusion and light RTM and we move on to producing closed moulds using calibration wax, designing and creating mould seals and resin channels, and planning and preparing injection and vent points. You will then use the film infusion process to make a semi-rigid closed mould to produce parts using RTM. We will show you the tiling method for producing composite moulds, used to prevent distortion when curing and using the mould at elevated temperatures. The mould will be vacuum bagged, oven cured overnight and broken out the next morning. The mould halves are then trimmed, finished, fitted out and released to make them ready to use for production of a Light RTM part. You will then use internal infusion media with the Light RTM process. Mould halves are gel coated and the dry fabrics and infusion media are sealed inside the semi-rigid mould halves. You will determine resin quantities required and learn to setup, check and operate a Light RTM injection pump. Resin is then injected into the closed mould under pressure and with the aid of a vacuum the Light RTM part produced. The course is concluded by assessing the components which have been produced. You will learn how to identify defects, their causes and possible solutions and how to produce the best quality Resin infused composite parts.